We all know that landfills exist, somewhere, but it’s not something that we really want to think about. Nearly everyone I share this list with is shocked when they learn the truth about American Landfills, but sometimes a shock is what we need to finally make a change. When it comes to garbage we all usually think “out of sight, out of mind”, but once that garbage leaves the can at the end of your driveway it has to go somewhere. More and more of it is ending up in landfills—all of which requires more and more space. 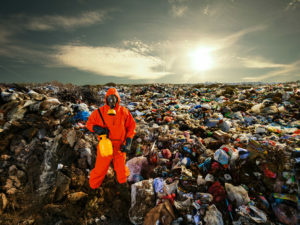 This means that the United States has the highest amount of waste generated per person of any other country in the world. The population in the 1960’s was 180 million. Almost 60 years later, it is nearing 320 million. While the population has only increased 78% our increase in waste was drastically out raced our increase in population. Right now we generate as much waste has 540 million people would have in the 1960’s! 4. Only around 10% of solid garbage in the United States is recycled each year. While this is an unfortunately low rate, it still marks a growth of 100% over the last decade. 5.The United States has over 3,000 active landfills and over 10,000 old landfills. Not only do all of these landfills take up valuable space, they also all create hazardous gas and could pose serious threats to groundwater. 6. Each day, people in the U.S. throw away enough trash to fill 63,000 garbage trucks. While the garbage collectors may only come to your house once a week, collectively we produce enough garbage to fill over 1200 garbage trucks every day of the year, in every state. 7. Most communities spend more to deal with trash than they spend for schoolbooks, fire protection, libraries, and parks. Not only is all of this garbage a waste of resources like metal, plastic, and textiles, it is also a massive drain on local and state government budgets. 8. Only 4% of the world’s children live in the US, but Americans buy (and throw away) 40% of the world’s toys. We can all buy fewer toys, opt for second-hand versions, and pass down the toys we do purchase to others. After all, we all know that a card board box and a dented pot are more fun than anything from Toys R Us . We are all becoming more conscious about recycling and currently we recycle 65% or 45.90 million tons of paper products, 3 million tons of glass and 2.5 million tons of plastics, and even 19 million tons of yard trimmings. But 85% of all the clothing we purchase ends up in a landfill. Changing the way we think about used clothing can affect the environment just as much as changing the way we think about plastic bottles. Sometimes small changes can have massive impacts, and one new App entitled GiveIt, is changing the way that people deal with waste. The folks at GiveIt are offering a revolutionary free donation pick up service. All you have to do is 1. Download the app 2. Take a picture of the clothing or other small house hold goods 3. Leave the items outside your door and let the GiveIt team take it away absolutely free. Together, you and GiveIt can help reduce the hundreds of tons of waste that are crowding landfills every year. Visit http://www.giveithub.com/ today to learn more.